"The Spy Who Killed Me went really well! We used it as a reason to bring people back into town for a weekend that had moved. Everyone really enjoyed the evening, and were really getting into their characters, including some spouses that I never would have expected to get so engaged. One of my friends who really doesn't do anything like this know the answer to every mystery in the game by the end of the evening. Everyone told me how much fun that they had and how much that they wanted to play the game again. Thank you guys again for everything that you do!" "We've already played most of the games you have in the 'suitable for kids' section, and my daughters wanted to do The Spy Who Killed Me next. We really enjoy your games. Kids really get into it, their bloodthirsty streak comes out early, and all sorts of unusual alliances are made! It rarely turns out according to logic, but they love it." "The Spy Who Killed Me was very enjoyable. Very good setup and plot. It was less of following the script, and more of a game of trying to figure out who was killing who. Which if anything made it more fun – 10/10!" "Eight of us have played 5 or 6 murder mysteries before, the scripted versions around the dinner table, and I wanted something suitable for an evening with friends from church. We were about 15 originally, but I couldn't find a boxed version for that many… and thank goodness I didn't!! While it's true to say that just about everyone was somewhat daunted about the information given them (myself included as the host!) our The Spy Who Killed Me evening was an absolute success! That finding the murder(er's) was one aim, the fact that everyone had different goals to achieve was brilliant… and I doubt very much that I will look for a scripted version again. Indeed… already people are asking about the next one ( nine hours after hosting it!) – so I'll be back here to download that… thank you for a marvellous evening!!!!!!!!! 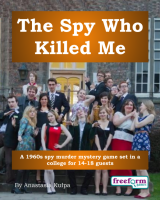 from 19 of us…"
"14 of us played The Spy Who Killed Me last night, and it was amazing! Everybody was in character, and each person had so many secret objectives to complete throughout. A few times, we had people running through the house shouting at each other for lying, poisoning, harming or killing each other! The most unlikely alliances were formed, and some characters were very good at keeping their secrets hidden, and diverting the blame to others! Thank you for such a fun night, the conclusion at the end was complex, but believable! At the end, everyone went round and talk to others revealing their info and secrets to others, and others were shocked at some of the characters secrets; things they had never even thought of! People are already asking for more!" "We had a lot of fun playing The Spy Who Killed Me a couple of months ago. I've neither played nor hosted a murder mystery night, so I must admit it was all a bit of a steep learning curve! I look forward to playing some of your other games in the near future." "The Spy Who Killed Me was very enjoyable and intricate enough to keep everyone involved." The Spy Who Killed Me is a dinner party murder mystery game for 14 to 18 guests and a host – download the free introductory pdf file. Welcome to Maudlin College, an institution with prestigious roots and an even more promising future. As we are nearing the end of the last term of the year, it is time to celebrate a hard year's work – in the lab, the library, and on the water – at the glorious Summer Ball. Maudlin College's best and brightest have gathered for a evening of celebration recognizing the recipients of prestigious research grants, and academic as well as athletic scholarships, which will be renewed – or not – this evening. It should be cause for celebration – but the evening is more sedate than planned; as the musicians arrived this evening, the Head Porter announced that Beth Garnet, one of this evening's student honorees, was found dead in her room. There are whispers about that Beth lost her life because of her involvement in espionage – if that is true, she cannot be the only secret agent in the college. The Spy Who Killed Me lasts for about four hours and is suited to an evening. It is often played over a meal – a finger buffet if possible to allow guests to circulate and talk in private. "We loved The Spy Who Killed Me. It was much better than other, more scripted games." The free introductory pdf file contains an introduction to the game, a cast list of all the characters, and a copy of the Oxbridge Oracle – plus details of how to buy the game. The Spy Who Killed Me is unlike many murder mystery games. Although the game starts with a murder, most of the characters have more important things to do than to investigate it. And the killing may not be over – it is unlikely that everyone will survive the remainder of the evening! "I had a great time playing The Spy Who Killed Me!" On the evening of the game the guests are met by the organizer, the Head Porter, and welcomed to Maudlin College. They then receive their detailed backgrounds – including dark secrets, objectives and money. The fun then begins as they form alliances, blackmail each other, steal items and maybe even try to murder one another! Along the way they may uncover some of the mysteries of The Spy Who Killed Me. Who is a double agent? Who leads the secretive Holly and Oak Society? Who is a professional assassin, and who is the mysterious 'Elsie'? What is the secret of the cryptogram? Depending on what the players choose to do, there are several different possible endings, but finally everyone finds out how they did, and what secrets everyone else was concealing. The Spy Who Killed Me costs £20.00 (GB pounds) or US $29.99. You can buy it in either currency, from anywhere in the world, as you prefer. The price will be converted back into your own currency for you, at today's exchange rate. We offer a Cast Iron Guarantee on all our murder mystery games. If you're not completely satisfied with The Spy Who Killed Me then please let us know within 30 days and we will refund you. See our full terms and conditions here.